We finally have an extensive look at what went on at the GTI Asia China Expo 2010 and along with plenty of games came a few surprises. I’m still trying to find any video posted from the event online but so far no luck – if anything substantial comes along I’ll update this post. 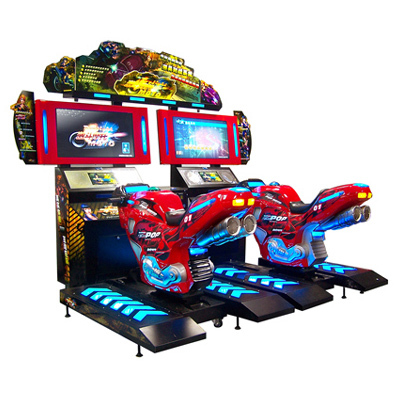 Some of the games you’ll see below: the first non-glasses stereoscopic 3D arcade game, Disney’s 3D Ping Pong; Pentavision’s DJ MAx Technika 2; Dino Survivor 4D by Belrare; a new version of Konami’s Mocap Sports; Taito’s Gaia Attack 4; Hypaa’s Mozarc; Andamiro’s Pump It Up Fiesta; a 10-player game called Ocean Spirit 2 and much more than we had seen previously. Here’s a video of the game I found on Youtube. The video quality isn’t great but it offers a good idea to how it plays. You can also see some screenshots on this page that gives a full rundown of the game. 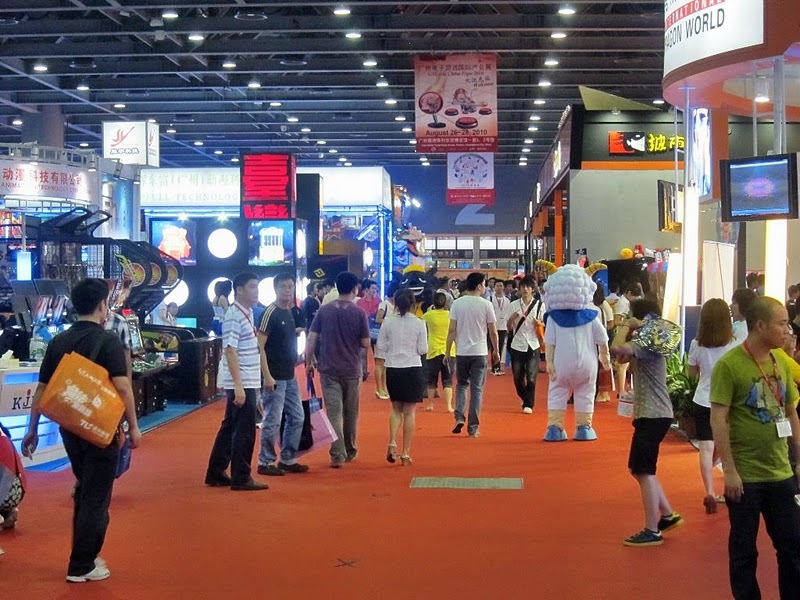 Today is the first day of the GTI Asia China Expo and that means more arcade games will be coming to light, especially as the Chinese arcade market has virtually exploded in recent memory (perhaps it helps that consoles are technically banned there where arcades are not). 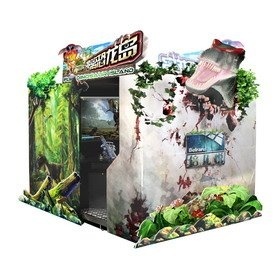 Unfortunately arcade news coming out of China can be very hit-or-miss, sometimes screenshots and video are plentiful for a game (like Crazy SpeedArcade) but most of the time it’s a miss with the only thing we get is a blurry shot of a random cabinet at a trade show or we get a thumbnail shot of a cabinet on a webpage. This will be another post of the latter as Chinese developer Belrare once again has a new product to show off but it’s nowhere to be found on their website, they haven’t responded to inquiries on their content and whether we will see it at IAAPA is completely unknown. The new game is called Dino Survivor. It looks similar to Let’s Go Jungle or Deadstorm Pirates but this time it’s about hunting dinosaurs. 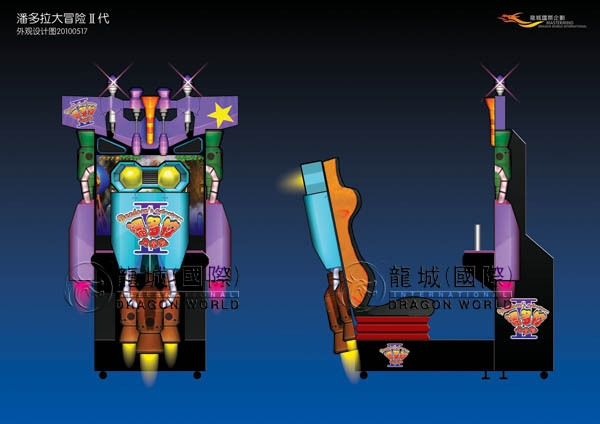 One thing to help this stand out could be that it uses stereoscopic 3D which many other Chinese games have been pushing lately and it also has mounted gatling guns (ala Vulcan-M). It also appears that they may be giving this one a good push in the graphics department where terms like “normal mapping”, “dynamic ocean lighting effects”, “3D particle system”, and others are part of this game’s visual resumé. So that gives us something to look forward to if we ever get a chance to see the game in more detail and see if it uses any of the modern techniques properly. At least the cabinet looks awesome, I like the vivid artwork it has although it could use a larger viewing window to help avoid the “den of iniquity” problem these kind of theater cabinets tend to run into. Gametime International (or GTI) is busy ramping up for another Expo and when the GTI Asia China Expo 2010 gets under way on the 26th, we know of at least one game that will be there – Pandora’s Adventure II by Golden Dragon. PA2 is the follow-up game to Pandora’s Adventure which was shown this past March. 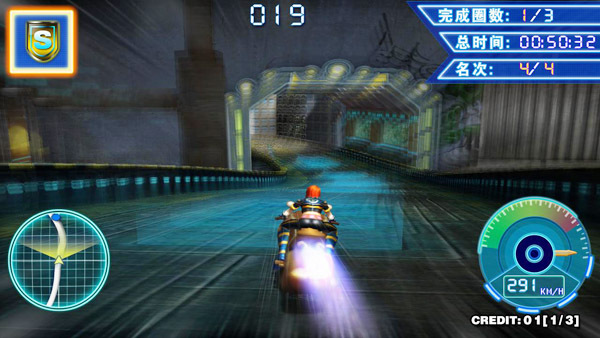 Considering how the time frame between the two titles is quite small, PA2 is an enhanced version of the first game, adding new characters, a motion-base seat and even a stereoscopic 3D display. It’s doubtful that will help much with the old polygon graphics that could be done on a console from the late 90’s (personally I would prefer 2D sprites over the old 3D stuff, if there was a choice) and they will have cabinet configurations ranging from 19″ screens to 52″ in size. The cabinet is colorful and goofy and I’m sure that it will sell for cheap. It’s been good to see that the coin-op amusement market is quite strong in China this year, although I hope that they can improve the quality of the games sooner than later. Chinese companies seem quite willing to experiment in different game genres which is a plus but too often we also see clones or bootlegs which dampens the influence of original games from that region. Graphically the original games will need some consistency as they are all over the map, some looking great (like Crazy Speed or Golden Dragon’s own Bloody Taierzhuang) and others looking like Pandora’s Adventure or worse. There was a time when clones or bootlegs in the arcade industry were very common. They still are out there to some degree and today we have a shining example of a blatant rip-off. If you take a look on this Chinese game distribution website, there’s a new game on that page which the translator calls Air Raid 2010 but the cabinet says Sky Troopers 2010. It’s a vertically scrolling helicopter game with a yoke controller, a motion base and it oddly has an infrared sensor net around the monitor that you only see on LCD light-gun games. There appear to be two cabinet designs for this as on the same webpage that shows the image above has some live pictures of a different cabinet under the same name. 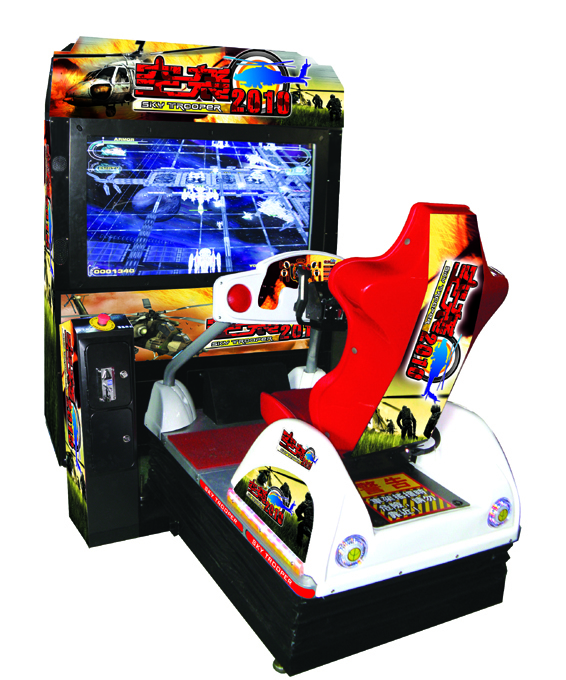 As you look at these other pictures, Sky Troopers looks like an exact replica of Tsunami’s Air Strike(2002), perhaps with some enhancements to the graphics for the monitor in use. I’m sure that Tsunami might be interested to know about this clone – at least the creators of Sky Troopers went to the length to create a new controller for the game but that still doesn’t change the actual game to avoid possible legal issues in doing such a thing since the software itself appears to have not been changed. It’s too bad really as a new helicopter game with a yoke controller like the one seen above could be exciting.